The very fact that you can make it sweet ,sour or just plain by adding or replacing one or two ingredients makes this curry such a handy one even for a sadya. Here in this recipe , pineapple pieces are cooked with a hint of chili and turmeric till tender and made rich with a coconut paste and yogurt and topped with a flavorful seasoning. Its so easy to make and can be done even with those canned pineapple we get in US. But make sure you drain it well and give a quick rinse before you make this . Even if i use those tender canned pieces ,i cook it again with chili and a pinch of turmeric n salt so that it absorbs the heat n salt . Grind grated coconut with cumin seeds , green chili , turmeric and salt to a fine paste. Whisk Yogurt without adding water until it is smooth. Cook pineapple pieces, a pinch of chili and turmeric ,with a cup of water( 1/2 to 3/4 would be fine sometimes) till it is tender. Bring to boil and let simmer for 2-3 minutes. In a very low heat add the yogurt and stir continuously and let heat through for a minute or two. ( make sure the heat is low that it wont curdle). Remove from heat. Heat oil in a small pan and add mustard seeds . when they pop up add fenugreek seeds and fry for 20 seconds . then add dried red chiles , chopped shallots and curry leaves and fry it for a minute or two. Pour over pulissery and serve. that sounds like a good idea..2 use canned pineapple..pakshe bhayangara mathiram aakumo??? don think i actually like the sweet spice balance actually..
Nice n authentic- fab clicks as always Sarah..
me too love moru kachiyathu red fish curry and rice... and loved ur pics... We call it pineapple pacchadi...ive posted the same recipe some time back and seeing ur pics... I feel like deleting my post :( really Sarah, love love love ur picsssssss.... 10,0000 loves... wink!!! That's a very tempting dish. Awesome pics Sarah..as always !! Pineapple pulissery looks absolutely delicious! Puliseri looks irresistible,creamy and delicious..
looks so creamy and delicious !! look superb dear and so tempting, amazing. I am also a fan of any yogurt curry...using pineapple surely balances it out!...very nice dish and click! Nothing can beat the taste of a good pulissery.. looks gorgeous too! Yummy and delicious recipe.. looks too good.. awesome presentation.. !! This is absolutely delicious and fantastic. 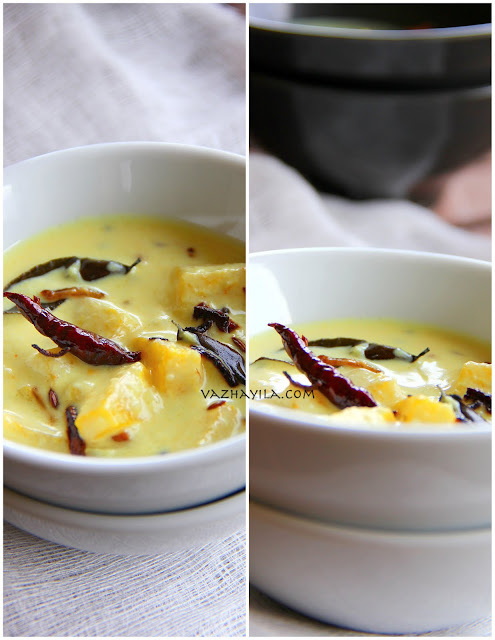 Awesome clicks.I never tried using pineapple pieces in curries. Will try this next time. I love dishes with pineapple very much..looks very tempting!! This is my fav..Tempting pics, Sarah..
Wow so delicious and tempting..
Yummy pineapple pulissery...my mom-in-law makes this delicious dish almost the same way. Very true with the canned pineapples its so easy and quick. I just love the sweet twist they add to this traditional Kerala dish. A very happy vishu to you and family. Hey Sarah, loved the simplicity of the erissery and particularly loved the shot of the tempered ingredients! My hubby had an expression which i cant express, i really am in love with you and ur blog.Too good it came the very first time. So so happy to hear all this shiney!!!!! Send me some of your recipes , I ll try it and post it ;).. I made this one today and it's super delicious. Thank you so much for the recipe. I followed it exactly the way you wrote.